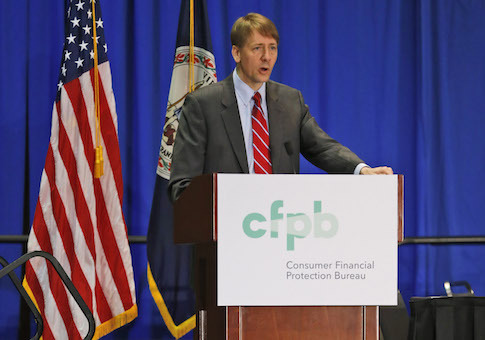 The Consumer Financial Protection Bureau is the most partisan agency in the federal government in terms of donations to candidates, according to campaign finance data. Employees at the CFPB, which was created by the Dodd-Frank Wall Street Reform and Consumer Protection Act, contributed nearly $50,000 during the 2016 campaign with all of that money going to aid Hillary Clinton or her rival, the insurgent socialist Sen. Bernie Sanders (I., VT). Agency employees made more than 300 donations during the campaign. Not one went to a Republican candidate. Rep. Sean Duffy (R., Wis.), a frequent critic of the agency, said that it is no surprise that the agency would contribute to the Democratic campaign. Republicans have tried to reduce the scope of the bureau's broad regulatory power since Sen. Elizabeth Warren (D., Mass. ), one of the most liberal lawmakers in the country, oversaw its creation. "CFPB employees fell over each other to give money to Hillary because she supported CFPB's desire to remain in the shadows and unaccountable to the American people," Duffy said. "No one is shocked that Washington bureaucrats would donate to the candidate who promised to maintain and expand onerous Dodd-Frank regulations that crush our community banks and local credit unions." The bureau did not return request for comment from the Washington Free Beacon about the donations. The CFPB was one of just four agencies in which every political contribution went to the Democratic Party or allied groups, though one of those agencies' donations came from just one employee. Peace Corps workers contributed nearly $25,000 to Hillary Clinton and her allies, including the pro-abortion Emily's List PAC, the second highest total of monolithic agency contributions. "Peace Corps is a nonpolitical federal agency," said a Peace Corps spokesperson. "Like all federal employees, Peace Corps employees must adhere to restrictions on political engagement established by the Hatch Act, which does not prohibit political contributions made on personal time." Employees at the National Transportation Safety Board, which investigates commuter and flight crashes, also gave 100 percent of their $3,000 in donations to Clinton and Sanders. An agency spokesman told the Washington Free Beacon that donations do not interfere with a worker's ability to perform his job on behalf of the taxpayers, nor did any donations violate the Hatch Act, which bars partisan activity on government time. "The agency does not track the private contributions of its employees or Presidentially appointed-Senate confirmed board members. The NTSB follows the provisions of the Hatch Act which is enforced by the U.S. Office of the Special Counsel," the spokesman said in an email. This entry was posted in Politics and tagged 2016 Election, Consumer Financial Protection Bureau. Bookmark the permalink.